Hello!!! Yay!!! I got another card made!! This one is for the May Reverse Confetti Sketch For You To Try, Color Throwdown and AAA Cards (birthday). I had big plans to get my card for this month's SFYTT done early, but then everything seemed to speed up and it was time for my shoulder surgery so any chance of making something until now was gone. And since there is just a day or so left before the challenge closes I knew I had to get something made and it needed to be simple, lol! I used the RC set Fabulous Flamingo along with the matching dies. The flamingo was stamped using my mini MISTI so I could get a really nice image of the flamingo. Then I die cut everything. 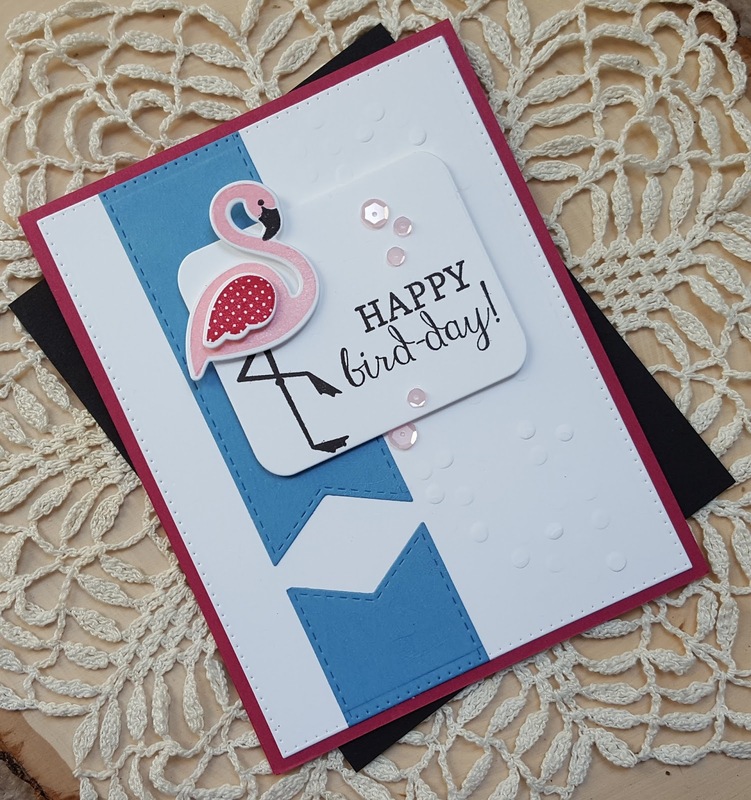 The rectangle panel was die cut with another RC die and stamped with the flamingo's legs and the sentiment using black ink and the body was adhered with foam dimensionals. The banner were die cut using MFT's Stitched Fishtail Flag stax dies, trimmed down and adhered to a white panel. 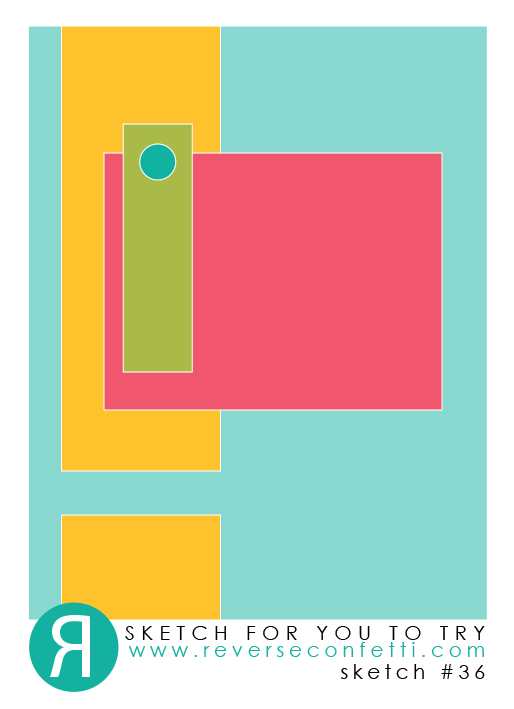 The panel was then die cut with my favorite AJVD polka dot rectangle dies. I partially embossed a portion of the panel for some additional interest. Add the sentiment panel to the main panel and then adhered that to a rose red card base. A few pink sequins from Pretty Pink Posh finished things off. Oh and I think I will post this to the current Simon Says Stamp Wednesday challenge of anything goes. Super cute card, Rosemary! Love your creative use of the flag dies! So glad you're able to create again--always inspiring! Enjoy the weekend! Super cute card! love the flamingo. Thanks for joining our birthday celebration at AAA Cards! Hey Rosie did not realize you had shoulder surgery . I had rotator cuff surgery several yeas ago. Hope all is well. I know it is a bit of a recovery. Your card is perfect for the sketch challenge. Rosemary, what a darling card this is. 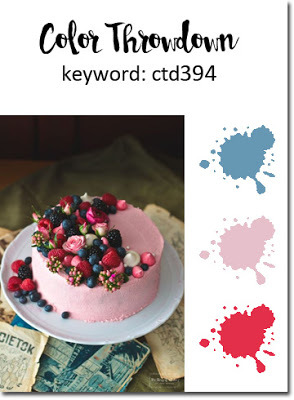 What a fun card and a super way to showcase the throwdown colors! Always love seeing your cards in the gallery! Fabulous card Rosemary! The flamingo is so cute. Oh this is so sweet! I have always wanted that flamingo set!! YAY for having your card ready in time before the challenge closes, Rosemary!!!!! And what a pretty card it is!!! Love the elegant flamingo and how you have done the blue with the fishtail banners!!!! The soft pink sequins are very pretty!!!!! Simply beautiful!! !